A note of thanks, to all those of you who came to my book launch last Friday evening. I really enjoyed myself, and I hope you enjoyed yourselves too. The views at the venue were quite spectacular, were they not? My book Two Baby Hands will also be on sale at Kinokuniya (Takashimaya), Select Books (Tanglin Shopping Centre) and Books Actually (Ang Siang Hill). You can also order it online from the publisher directly -there are no extra charges for delivery within Singapore. One of the poems I read at the event was an old one entitled Changi Airport. But reading the Sunday Times today, it strikes me that the poem seems to have become rather topical again. One thousand and thirty-six people will receive extra training in how to clean toilets - all because Changi Airport slipped to 3rd place in the latest global rankings. What a fascinating country we are. All 1,036 cleaners at Changi Airport will soon be sent for retraining. That is one action plan being taken by the Civil Aviation Authority of Singapore (CAAS) in response to Changi's slip to third place in a global airport ranking exercise. In the survey of 190 airports by British-based consultancy Skytrax, Changi scored its lowest ranking in eight years - behind Seoul's Incheon International and Hong Kong International Airport. It ranked second last year. It scored highly - among 8,640,552 travellers from nearly 100 countries surveyed - in areas like leisure amenities, duty-free shopping and airport dining. But it lost out in categories like washroom cleanliness and security processing. In an interview with The Sunday Times last week, the CAAS said it has identified two problem spots where toilet cleanliness may have fallen short. Toilets at the 28-year-old Terminal 1, the 'grand old dame', are old. When some are being upgraded, more pressure is put on the remaining toilets. Terminal 1 is being upgraded. About 15 per cent of the work is done and the process is slated to be completed in 2011. At Terminal 3, which was opened last year, three sets of toilets in the public area are also 'highly utilised' on Fridays and Saturdays. This could be another reason for the lower cleanliness score. Mr Foo said CAAS will also enhance the monitoring of toilet cleanliness via technology. Full implementation will take six to eight months. Changi Airport isn't dirty. The toilets are fine. Changi Airport lost to Incheon and Hong Kong International Airport, because these two other airports are also very, very good. In terms of actual points scored in the survey, all three airports were also very, very close - Skytrax itself said in a statement that any one of them might have finished first. But you know the mentality of Singapore corporate management (where face is concerned, it's frankly not that different from the SAF's). Since Changi Airport had lost, even by a very little bit, therefore something - and someone, somewhere - needs to be blamed for the defeat. This time the blame goes to the airport toilets. And also to the management person in charge of the toilets - you can be sure about that. Whoever he is, he can say bye bye to his bonus. Anyway, below is my old poem Changi Airport. Seen in the context of the Skytrax airport survey, maybe the moral of the story is ..... please don't make a mountain out of a molehill. If the airport is safe, clean, modern, efficient and comfortable, that's enough. Truly, no traveller is going to come back to Singapore more often, just because you upgrade the brand of the hand soap in the toilets ... or use a hi-tech machine to count the number of germs in each toilet bowl ... or provide 5-ply toilet paper for extra-delicate buttock skin. of a little nation’s pride. RETAIL sales in April plunged the most in a decade as the economic crisis crunched consumer spending on items such as motor vehicles and computers. There were some bright spots in the new numbers - jewellery, watches and other small-ticket items held up - but the overall picture was one of gathering gloom in the retail sector as unemployment rose and confidence sank. The retail sales index slumped 11.7 per cent from a year ago, its worst showing since a 12.7 per cent fall in January 1999. Singaporeans are spending big in this year's GSS. SINGAPOREANS are spending big bucks at this year's Great Singapore Sale. According to credit card figures released by MasterCard on Tuesday, the first GSS weekend saw Singapore cardholders chalking up bills of US$26.3 million (S$38.3 million) - an increase of seven per cent from the same period last year. Locals were also swiping their credit cards more furiously, with the number of transactions they made in the first weekend rising 15 per cent from last year to 283,703 this year. THE optimism in Singapore's property market is unsustainable, given an impending over-supply of new flats, weak rental demand and the fact that the country remains in a recession. That is the pessimistic view of two research houses, which concluded that the price recovery is highly fragile. Citigroup said the market is not at the start of a cyclical upswing and that the spike in home prices cannot last. 'We caution against over-optimism, because fundamentally the market is not ready for a sustained price recovery,' analyst Wendy Koh wrote in a report on Thursday. In the same report, she downgraded Allgreen to 'sell', putting the developer in the same 'sell' basket as City Developments, CapitaLand and Keppel Land. Citi also downgraded Wing Tai to 'hold'. While there has been strong resale demand, the call for new homes is patchy and rental demand remains weak, Ms Koh said. SALES of new private homes rocketed to an 'outstanding level' last month thanks to price cuts and the share market rally boosting buyer confidence. Recession-defying numbers out on Monday showed there were 1,668 units sold in May, just a tad below the all-time high of 1,731 set in the boomtime month of August 2007. Sales were also well ahead of the already-strong developer sales of 1,214 units in April and 1,220 in March. This has encouraged 'many speculators' who were sitting on the fence to take action and strike while the iron is hot, taking advantage of the low prices in the market across all levels, he said. Other experts cited pent-up demand and buyers' fear of missing the boat as other factors behind the high sales. Developers lifted a gear last month as well, launching 1,161 new homes, up from 1,085 in April, according to Urban Redevelopment Authority data. THE latest quarterly labour market data paint as dismal a picture since Sars hit Singapore six years ago. In the first three months of this year, there was a net loss of 6,200 jobs - far worse than the 1,000 estimated at end-April by the Ministry of Manpower (MOM). Earnings also fell, unemployment rose and people took a longer time to get another job, said MOM yesterday when it released the finalised job market figures for the January to March period. THE four-day PC Show pulled in a record 1.13 million visitors, as Singapore's consumer confidence surged in the wake of news of 'green shoots', that the global economic crisis might have bottomed out and could be on the mend. Last year, before the economy began its plunge, 1.1 million people visited the event, Singapore's longest-running consumer technology event. Consumer spending at the show could even surpass last year's take of $51.7 million. As at 6pm last night, three hours before the close of the show, exhibitors had reported receipts of more than $48 million. PC Show organiser Lines Exposition and Management Services project manager Gillian Loh said that she was confident 'we can top last year's figure'. So dear readers, what's your take? A beautiful friendship is possible between Malaysia and Singapore. It really just depends on the deaths of these two men. One day, when both of these men are out of the picture for good, all the unhappy historical baggage will be thrown away and forgotten, and love will blossom naturally between the two nations - you'll see. For now, the clash of the two monumental egos will constantly keep Singapore and Malaysia apart, hindering, among other things, Singapore's involvement in the Iskandar Project. KUALA LUMPUR: Former Malaysian premier Mahathir Mohamad yesterday poured fresh vitriol on Singapore, calling Minister Mentor Lee Kuan Yew a 'little Emperor' and describing the republic as a 'new Middle Kingdom'. In a no-holds-barred tirade on his blog Che Det that coincided with the tail-end of an official visit by Mr Lee to Malaysia, he slammed Singapore for putting itself in the centre of the region, and also took issue with other topics such as the Iskandar development in Johor and the supply of water. Mr Lee, he charged, had in his 'triumphant visit to Malaysia' made it known to 'Malaysian supplicants' that Singapore regarded the lands within a 6,000-mile radius as its hinterland. 'This includes Beijing and Tokyo and of course Malaysia,' he wrote. He again insinuated that Malays would lose out in the development of the Iskandar region in Johor. Mr Lee and Tun Dr Mahathir had crossed swords over several national issues when they were both prime ministers and Malaysian newsmen have noted that Mr Lee did not meet his erstwhile adversary on his current trip. Mr Mahathir has used his widely read blog to comment on all and sundry and also to launch attacks on political opponents, including his successor, former prime minister Abdullah Badawi. I was planning to announce the details a little closer to the actual launch date. But in the meantime it turns out that there's nothing else that I feel like blogging about anyway. So - I might as well make the announcement now. 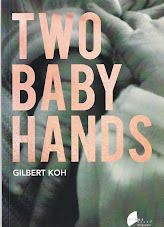 Ethos Books has previously published books by award-winning local poets such as Alfian Saat, Edwin Thumboo, Alvin Pang and Felix Cheong. Ethos Books is well-known among literature buffs in Singapore as a serious producer of the good literary stuff. Interestingly, Ethos Books is also the same publisher which brought to Singaporeans the boldly political book "Days of Being Wild" which chronicles the 2006 general elections from the opposition's perspective. The book was written by Dana Lam. Does the name sound familiar? She was the former president of Aware who has become President of Aware again, following the recent old guard vs new guard saga . 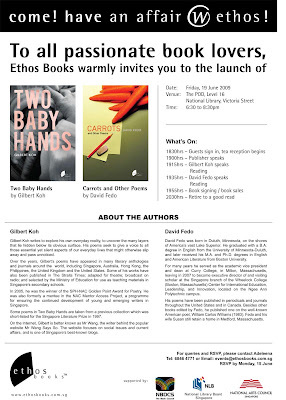 Anyway, if you wish to attend the launch event for Two Baby Hands and Carrots, do send an RSVP (as mentioned in the poster). It will help Ethos Books to plan the event appropriately. My thanks also to the National Arts Council, the National Library Board and the National Book Development Council of Singapore, for supporting the publication of the book and sponsoring the launch event. Wait ... Before I go, one last sample poem from the book. This one is for those of my readers who wish that my poetry were a little more image-filled and complex.There are several layers of meanings in this poem too, and I've deliberately created room for each reader to bring his own interpretation to the table. Guess who's the old man in this poem? YESTERDAY'S article, 'Private home sellers raise asking prices', raises a vital point that caution is needed, and so far no one in authority has sounded a warning. Property prices seem to be edging up, and the optimism of sellers seems to be related to the rise in stock prices, which have gone up by more than 20 per cent. This prompts the question why no word of caution has come from any chief executive that there has been no fundamental change in his company's earnings in the past two to three months to warrant such a hefty increase in the prices of its stocks. Perhaps they are just revelling in the increase in their portfolios. There has also been no warning from the Stock Exchange. Obviously, all market players are making hefty profits from their quick short-term trading, so why should anyone rock the boat? 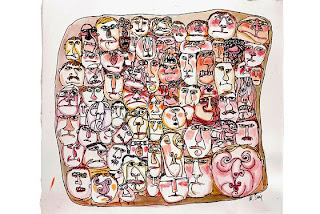 One banker told me it is simply speculation, as there is excess liquidity, and returns on bank deposits earn a pittance 0.5 per cent interest at best, so there is no point keeping the money in the bank; it is better to pledge the deposit, borrow heavily and play the market. No one is sounding the warning bell, because any true blue businessman knows that when fundamentals do not support values, it is a matter of time before the collapse happens, as prices will ultimately adjust to reflect realistic values. This may well happen here, unless a strongly worded note of caution is sounded soon. Of course, the other view is that the economy is actually recovering. That's something that Anil does not seem to have considered, LOL. It's a widely accepted theory that the stock market is a leading economic indicator. This means that the stock market runs several months ahead of the general economy. The stock market takes a dive before the economy takes a dive, and the stock market recovers before the economy starts to recover. According to this theory, the stock market's current good performance could be a sign that economic recovery is on its way. Anil's letter almost suggests that there's some conspiracy among market players to prop up the Singapore stock market. Every now and then, I too enjoy a good conspiracy theory. But it's important to note that the current good performance of the stock market isn't limited to Singapore. All around the world right now, stock markets are doing very well, and have been doing very well for the past two or three months. Two weeks ago, the world saw one of the most spectacular single-day stock market rallies ever. On May 18, the Sensex, India's benchmark stock market index, jumped 17% in a single day. It would have jumped even more, but the heavy buying triggered automatic suspensions, and the "circuit breakers" kicked in to stop trading for the rest of the day. The Sensex's performance was triggered by the victory of the Congress Party in India's elections. But sometimes what's even more telling is not what the stock markets reacted to, but what the stock markets did not react to. North Korea, the world's most famous rogue nation, shocked the world by test-firing its nuclear missiles on 25 May. But Asia's stock markets (including South Korea's) continued to rise serenely. Meanwhile, the long-suffering GM Motors announced late last week that it would file for bankruptcy this week. But US stock markets largely ignored this event, and the S&P 500 hit a seven-month high yesterday.